Slip away to a private Tahitian island and indulge in luxurious accommodations, attentive service and effortless elegance. Spend an enchanting day exploring the Oasis Pool (the resort’s own natural wonder) and the saltwater lagoon full of native fish and stingrays … or the glorious Tahitian and Pacific Rim treatments in the world-class spa. 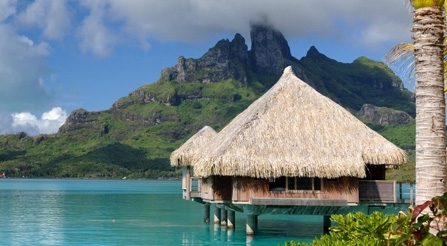 St. Regis Bora Bora vacations start at US$3679 per person to include Airfare from Los Angeles on Air Tahiti Nui, inter-island air on Air Tahiti, airport to resort transfers and 5 nights accommodation, including one FREE night and breakfast daily. In addition you will receive a complimentary upgrade based upon availability. This special offer is valid for travel through May 31, 2011, and pricing is subject to change and based upon availability. Inquire for other offers at the St. Regis during high season which begins on June 1st. The St. Regis Bora Bora is one of the most amazing locations in all of French Polynesia. Call Remarkable Honeymoons to reserve your spot in one of the St. Regis’ Luxury Overwater Villas. Our toll free number is 1.866.614.1803, feel free to fill out a Request Quote Form with your preferred dates, or send a direct email to Request@RemarkableHoneymoons.com.